by Henry S. Cole, Ph.D.
A Sarayaku Kichwa village in the Amazon Rainforest region of southeastern Ecuador . To get more info and see a great movie, “Children of the Jaguar, go to Chakana Chronicles. In the coming weeks, Eko-squared will provide a series of posts on indigenous people and why their survival is of vital importance to the entire world. A struggle to survive: Indigenous peoples the world over are the earth’s most effective protectors of nature; From tundra to rainforest these communities depend on healthy ecosystems for their sustenance. They are also in a life and death struggle to survive the onslaught of development including mining, oil and gas extraction, monoculture agriculture, logging, and hydroelectric projects. Rather than protect indigenous peoples, many governments either openly or covertly support the developers. As a result cities large numbers of displaced tribespeople wind up living in the squalid slums in cities like Manaus in the Amazonas Province of Brazil. Many who resist have been killed. Contact with outsiders often infects indigenous peoples with diseases with deadly consequences. Smoke billows as an area of the Amazon rainforest is burned to clear land for agriculture near Novo Progresso, Para State. Photograph: Nacho Doce/Reuters. The article in the Guardian cites scientists who assert that the rainforest is losing its ability to regulate climate. Go to Guardian article. A Range of indigenous communities: Recently there have been news reports on newly discovered tribes in remote regions of the Amazon Rainforest. 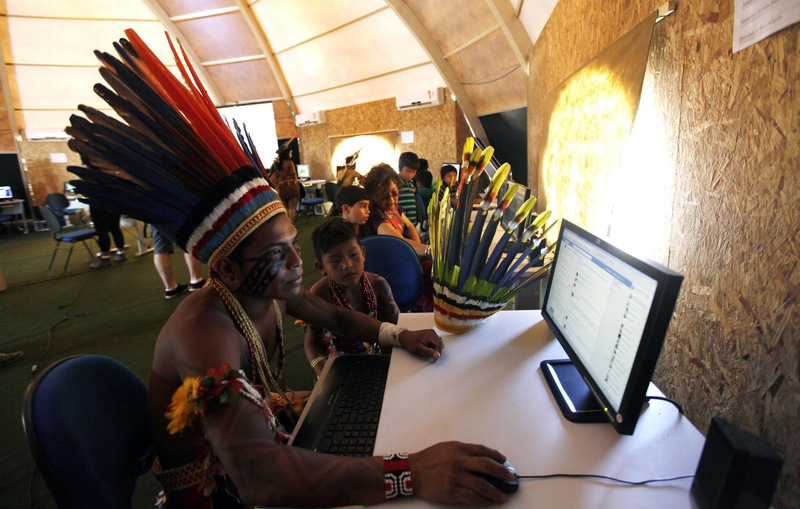 Brazil’s Amazon is home to more uncontacted tribes than anywhere in the world. There are thought to be at least 77 isolated groups in this rainforest, according to the government’s Indian affairs department. FUNAI. See full article on Survival’s Website. At the other end of the spectrum are indigenous peoples who have been dispossessed of their ancestral lands and forced to live in urban “favelas” or “barrios” often in poverty. In some cities (e.g. Brazil in the leadup to the World Soccer Cup (2014) have had to fight to for their homes once again. Primitive? Although many people in the “civilized world” view indigenous societies as primitive, a closer look tells a very different story. Indigenous peoples tend to foster cooperation within the community and a harmonious relationship with nature. Rather than being “consumed by consumption” indigenous communities hunt, gather, grow and build what they need. They don’t work for a boss, but for their families and communities. They keep their traditions including music, dance, stories, and art. What herbs are good for a sour stomach or headache? Ask the shaman. 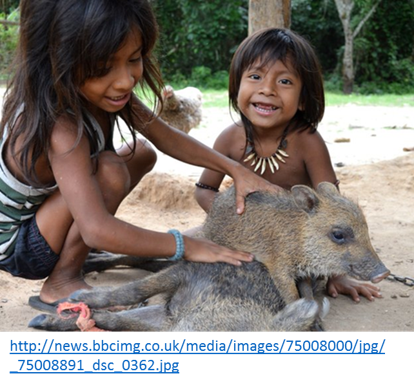 Awa children play with baby Peccaries. ← Armenia: The oligarchs are eating the forest: SIGN THE PETITION! Columbus Day 2015: Time to Protect Indigenous Peoples: See Amazing Videos.